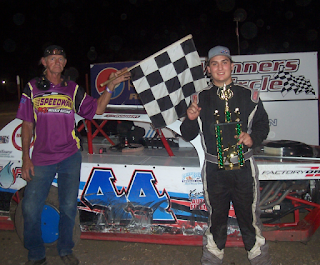 White City, Oregon...July 21...Zach Fettinger won the 25 lap IMCA Modified Main Event Saturday night at Southern Oregon Speedway. He has won the last three races in which he started. Fettinger took the lead on the second lap and led through several caution periods and a last lap restart. Duane Orsburn was a season best second ahead of Albert Gill, Jantzen Knips and James Welshonse. Chico, California visitor Tyler Rodgers turned in a dominant performance in winning the 20 lap IMCA Sport Modified Main Event. 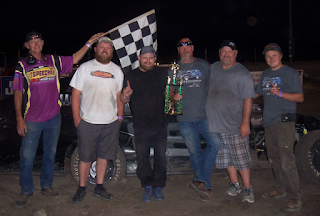 Rodgers took the lead from Jimmy Lipke on lap seven and led the rest of the way in victory. Lipke settled for second ahead of Mike Medel, Branden Wilson and David Marble. Chad Cardoza won his first 20 lap SODCA Dwarf Car Main Event of the season. Cardoza led from the start and lost the lead briefly midway through the race to Mason Lewman. However, Cardoza regained the lead a lap later and held off reigning champion Brock Peters for the win. Camden Robustelli, Josh King and point leader Cody Peters rounded out the Top 5. 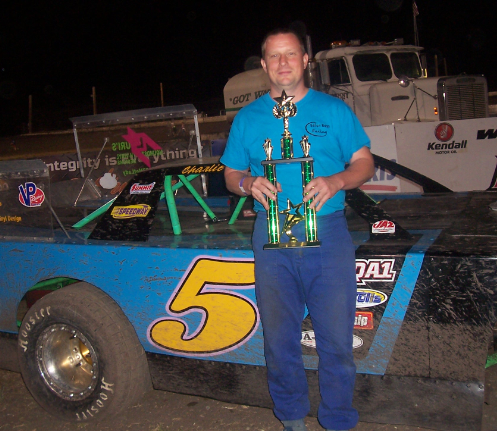 Point leader Charlie Eaton won his third Valley Store-All Late Model Lites Main Event. Lee Doty led the first five laps before Eaton raced by on the back stretch for the lead. Eaton held off Doty the rest of the way to win. Danny Prewitt finished third, followed by Greg Arnold and Eric Aos. Mark Minter won the 15 lap OTRO Hardtop Main Event. After winning the heat and Trophy Dash, Justin Krossman led most of the Main Event. Minter gained second on a lap five restart and proceeded to move on to Krossman's rear bumper. Minter tried high and low until pulling down low and beating Krossman back to the white flag. Minter led the final lap to win ahead of Krossman. Greg Hickman, Jamie Britton and Jay Smith. The track takes a week off before returning for the two day WSDCA Dwarf Car Nationals on August 3rd and 4th. The Friday portion of the show includes JOAT Labs Hornets, and the Kendall Oil Winged Sprint Cars and Valley Store-All Late Model Lites will be running on Saturday night. For further information, go to www.southernoregonspeedway.com. Heat Winners (6 Laps)-Albert Gill, Zach Fettinger. Trophy Dash (4 Laps)-Albert Gill. Main Event (25 Laps)-Zach Fettinger, Duane Orsburn, Albert Gill, James Welshonse and Jantzen Knips. 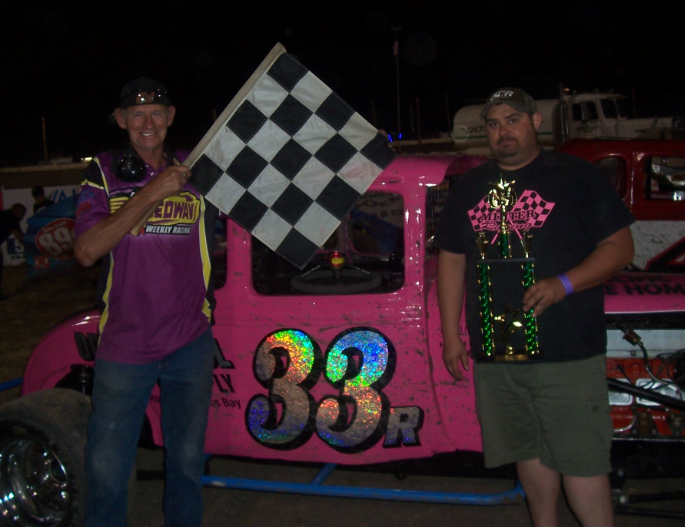 Heat Winners (6 Laps)-Jimmy Lipke, Tyler Rodgers. Trophy Dash (4 Laps)-David Marble. Main Event (20 Laps)-Tyler Rodgers, Jimmy Lipke, Mike Medel, Branden Wilson, David Marble. Heat Winners (6 Laps)-Kalvin Morton, Mason Lewman, Brock Peters. A Dash (4 Laps)-Cody Peters. B Dash (8 Laps)-Josh King. Main Event (20 Laps)-Chad Cardoza, Brock Peters, Camden Robustelli, Josh King, Cody Peters. Heat Winner (6 Laps)-Lee Doty. Trophy Dash (4 Laps)-Lee Doty. Main Event (20 Laps)-Charlie Eaton, Lee Doty, Danny Prewitt, Greg Arnold, Eric Aos. 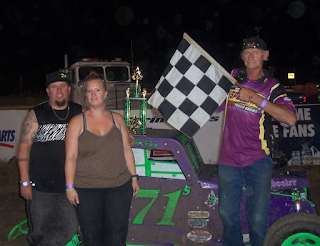 Heat Winner (6 Laps)-Justin Krossman. Trophy Dash (4 Laps)-Justin Krossman. Main Event (15 Laps)-Mark Minter, Justin Krossman, Greg Hickman, Jamie Britton, Jay Smith.